Creative woodcrafters and hobbyists alike have turned to alternative sources for the rare wood and sweet deals they crave. We support this trend — it brings recycling and a certain amount of free-thinking to woodworking. Lately, we’ve heard this question a lot: How much should I pay for this recycled wood from old barns or 100-year-old houses? The quick answer is, it’s worth as much as you’re willing to pay for it. Sure, you can weigh in a few factors, such as, what are you looking to do with the wood? But when it comes right down to it, you must decide whether or not a crossbeam from an old barn in Quaker country is worth as much as your first car. There are two basic schools of thought here. The first is the bargain-hunter — we use that term with as much affection as possible, as we normally fall into that category ourselves. These guys want good wood for less cash than retail and are willing to look in odd places to get it. The other is the treasure-hunter: the guy who simply must have that pile of 80-year-old barn slats, because the dining room table he’ll make from them will put a big smile on his wife’s face. Both guys, looking at the same wood, will value the stock differently; and the party selling it will undoubtedly have a third value in mind. Keep your project and purpose in mind, and make sure you know the going rates for retail wood and other antique wood, before diving into a custom deal. Check your local outlets, and talk to other woodcrafters in your area. A deal might be sitting right under your nose. Most of all, remember that if someone values their stock above your budget, there are other deals out there. Don’t feel bad about it — find another source. 101 Responses to What’s Old Wood Worth? There is one problem with salvaging barn wood. When you salvage the wood, you lose the barn. American barns (everything from plain old corn cribs to the famed Pennsylvania bank barns) are icons of the American landscape and are disappearing at an alarming rate. Though much of the disappearance is due to neglect and the demise of small farms themselves, increasingly barns are vanishing and turning up as paneling, tables, cabinets, recording studio walls, and other recycled projects. 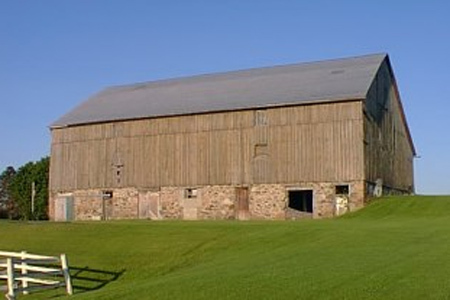 The Smithsonian Institution did a traveling exhibit a few years ago called “Barn Again.” The National Trust for Historic Preservation listed the American Barn among the top ten most endangered architectural structures. Living in the south, you still see barns pepper the landscape. But you don’t see as many. How many log cabins do you see on the landscape? If you troll around craigslist you’ll find folks offering their barns for sale all the time. How much longer before the wooden barn becomes as rare as the cabin? If the barn is falling apart and needs to be torn down for safety’s sake, then by all means someone should recycle that wood. I just wanted to mention that unlike most recycling efforts, there is a downside to recycling barn lumber. There are only so many of them left. We have a Very old Cabin 1800’s that we have taken apart & stored and are willing to sell. We also have cypress wood from tenant houses on our farm that we have taken apart and stored in our large barn.We are located in Tunica, Ms. Correction: The American Barn, generically speaking, was not listed on the National Trust’s most endangered list. Sorry about that. Individual barns have been listed, and all of the southern Maryland tobacco barns were listed. Sadly, it doesn’t change the fact that barns are disappearing across the country. I would be interested in the late 1800s boards. What email address should I contact? I also have wood from late 1800’s home in Texas. Would love any contact info on anyone interested in buying. I have a house that was built in the late 1800 early 1900’s that is being dismantled right now. Would you be interested in it? Located in Malvern AR. I have pine flooring from a 200+ year old log cabin. I’m not sure whether it is heart pine or simply very old pine. Though it has been partially scraped, they still have remainders of the old paint on them. There are 59 boards in total. They vary in thickness from 3/4″ to 1 1/8″. The widths vary from 6″ to 13″ and the lengths vary from 33″ to 136″. I can provide a list of the individual boards and their dimensions in inches. I am located near Roanoke, VA.
Back in the day, my Dad and I salvaged wood from an old barn to floor the new house addition. My step mom’s cousin was selling his small farm and the barn was going to be demo’d for a new housing development. We went through lots of miter saw and planer blades. In recent years I have heard of people using metal detectors to find all of the metal. I WISH WE HAD BEEN THAT SMART but the floor is absolutely beautiful and well worth the cost and time. perhaps not everyone who sells the wood off the barn does away with the rest of it. If I could sell the old wood on the barn and buy new wood for it and make a profit in the process, I’d probably go with that, especially if the people who wanted to old wood would do half the labor taking it down. A long time ago (in a galexy far, far away) I used to work for a company that took apart barns for the lumber. Most of what we salvaged was barns that were already down or badly damaged by storms and neglect, but we would take down anything that the owner wanted gone. The last job I worked on was disassembling a very old, almost completely solid oak 2 1/2 story barn. The barn was in great shape and at least 200 years old, since I found one of the replacement pine siding boards with the date 1901 on it. I know the farm it was on pre-dated the majority of the town, at least. We took that barn down and got a lot of lumber out of it, and do you know what they put up in that spot? One of the unfortunately many insane churches in the area put a freaking currogated steel pole barn up there as a church. The hell??? If they had just taken all of the floors out of one end of the barn and presure-washed the main beams, and then re-sided and insulated the building, the simple age and beauty of the barn’s design would have lent the sanctuary a very holy aura. Instead what they got was something cheap farmers throw up to put sheep in. Hurrah. Anyhow, I remember de-nailing boards with a combination of a pair of vice-grips and an automotive dent-puller on the other side, then pressure-washing and cutting to length the beams and planks. Eventually a semi or three would turn up and haul the wood off. I remember being told that at least a few barns-worth of 100+ year old oak, cherry, ceder, spruce, and pine was being sent to France for wood paneling on houses. Crazy! I still have a few samples of raw wood and polished wood around somewhere. I’ll tell you what, you compress cherry or oak for 150 years with a few hundred tons of weight on it, it makes some VERY hard to work with, but completely georgous, wood. My wife loves the look and texture of barnwood furniture, so I’ve been on the lookout for alternate sources. If you don’t need a lot of structure, old cedar fence boards are the best I’ve found. There’s not a lot of historical value in my neighbor’s 15 year old leaning monster. I’m also looking at ways of making ‘faux’ barnwood. I have the texture down (distress the piece with a paintbrush comb) and some test pieces on the roof trying to sun-bleach the right color. Anybody else trying this? If they’re a hazard, get all the use you can out of them, but all in all, I like old barns on the landscape. I live in a rural area and just on my route home from work there have been 5 old barns taken down in the last two years. When there aren’t many left that is a significant number. My original barn (40 x 60) was built in 1906 with an equal size addition in 1951 so we have a two story 60′ x 80′ to house our 33 llamas, hay, scale, tack and equipment. Interesting that they built the addition just like the 1906 original, were it not for the ceramic block (nice to clean) they used for the first floor level and the steel beams they had to put in to replace the sagging wood ones, you couldn’t tell it was 45 years younger. A modern barn would be much easier to maintain but certainly lacks the character of the older ones. We are putting up steel barn siding on this to do a quick cover up that will seal out the drafts and preserve the wood siding that will stay exposed on the inside. We’ve put in all concrete floors, replaced missing and falling apart doors and windows and ripped out old rotting feeders. (Side note, I used the oak, full 1-by lumber from a big hay feeder to “panel” my kitchen when it was remodeled. Neat effect!) These old monsters are very expensive to maintain and it’s no wonder they aren’t, especially when they are no longer being used. One other barn experience. My dad sold his 1860s-era barn from the farm when he was retiring and moving to Florida to a guy for $1,000. Huge, long hand hewn beams, wide board siding (most of it 10 inches wide and up) and two inch thick 20 and 30 foot flooring. Stipulation was he take it down and take it ALL off of the property. He even took the foundation stones! Those beautiful beams still haunt me to this day, wish I had all of them. Growing up my brother took a barn down… with a chain saw. Burned it up for fire wood. It was the early 70s. Ouch! I actually just bought a load of old barn wood from someone last week. I’ve been waiting for years to come across some old beams and whatnot to use for several projects. I finally found an ad on craigslist for someone with old barn wood. The barn went down in a storm last year – it was built around 1900. I’ve been amazed at how easily the wood (most of it is pine) cleans up and how gorgeous it looks. A couple friends in college met someone who needed a barn torn down and they agreed to do it for free if they could keep whatever money they made selling the wood. Turns out that the entire barn was made from chestnut and they made far more money than they ever dreamed of! Humans have been tearing down neat buildings and using the materials to build new buildings throughout history. It’s simple resourcefulness, and frankly environmentally enlightened. However, I’ll agree that it can be historically painful. While it’s certainly a good idea to preserve some old buildings like this with things like the national register of historical places, but I think it’s a bad idea to have such a negative stigma against people wanting to make use of the materials resource rather than leaving an unwanted building littering the landscape while building with completely new materials. Naturally the example of tearing down a great old building and replacing it with something ugly would best be avoided as well. Hopefully someone reused the materials at least. That old lumber is great. Years ago my dad demo-ed (past tense of demo?) old buildings to build the home he’s living in today. I think seeing that in my formative years contributed to my environmental awareness today. Steve, I am interested in your 4 room house and your stones. Could you please reply to Melody Moss at the email listed above. Thank you. I take down barns and old homes for a living. We re-purpose ALL usable lumber and metal. I’ve been doing this for 2 years now and must say that the land owners (mostly farmers and ranchers) really appreciate the service we provide. These structures are in unusable condition and are a haven for undesired critters, a fire hazard and a tax on the land owner. Every one we’ve removed has had a positive outcome for both parties- the land owners get more usable land and are happy to know that their history is being cherished by furniture maker/owner or home owner. We take great care to research the history of the structure and pass that along with the recycled material. Plenty of photos and scraps of past life are passed on to a new generation. The alternative is bulldozing and demolition. By taking these structures down carefully (board by board, nail by nail), we reduce the waste and re-use the sturdy and beautiful old growth wood. I just purchased a home in Millington NJ. The home was built in 1915 and it has a old garage that is falling apart. Each wall is leaning in a different direction. I am trying to find a service like yours near me that will do a tear down and salvage the materials. Any insight would be appreciated! we have a old farm house in Nebraska, that we are looking for someone to sell the interior woodwork & doors too. Can you be of any help. did you ever find buyers for your project? would you be interested in taking down an old school house, at least a hundred years old. The original part of the building is all tongue and groove, 1×4…the building is still solid. Floors, walls, and ceiling are tongue and groove. The building has a very unique history. Our church inherited the land from one of our members and we do not have the time or resources to dismantle the building as it should be done…lovingly and carefully. It is a huge old building. I would have to ask my son about the dimensions. Hi Betty, did you get your schoolhouse dismantled? Ingested in starting this same business in another state, I’d like to consult with you. I know this is a really old post. Do you still do this? Where are you located? I have a friend who has an old farmhouse, I think with a barn, in Idaho that needs to be removed. Would rather have it used as reclaimed wood than burn it down. Any interest? Seven L. Bar: How can I reach you? Can anyone provide me with info on how to identify and find the value of wood from our home built in 1882 in NE Ohio? We are thinking that at least some of it may be American Chestnut and would like to have it confirmed before we recycle or sell any of it. Who can I contact? Where are you located at please email me leonsink@gmail.com thank you. i have a house built in 1700s chestnut post and beam with center 4 or 5 fireplace chimney to sell for dissasembly and removal. located in oakdale ct. lots of history. Can anyone provide me with info on how to identify and find the value of wood from our home built in 1861 in WV. I am interested in having this home torn down and sell the wood for reuse. The house is approx. 2400 sq feet and is possibly all oak. House is falling down; building new home on site. Please contact us at tanatha.amos@yahoo.com; if interested. I have 100yr old pine boards from framing ect from a old house we had to tear down what is this old wood worth? Im trying to get it sold because it is beautiful lumber. Anyone know? I have a 17,100′ warehouse for sale. It was built in 1920. It has some tongue and groove wood and square beams throughout. I don’t know much about this kind of stuff. Interested in someone tearing the wood out and purchasing. This wood is in great condition! I am interested in your homes. Please reply to msmelodyshamrock@ aol.com. I have an old home in Giles county TN. The original part on the house is Over 200 years old. It dates back the civil war era. It has American chestnut logs. I am looking to sell the entire house if you are interested please email me. James, is the old home in TN still available? If so, please send any information to asdofindiana@gmail.com. Thanks. Dan Persic, are you still interested in purchasing log cabins to deconstruct? If so, I have a large hand hewn red chestnut log cabin in Perry Co. Tennessee. Yes we have an old home on our property that has old beams etc. It’s over hundred years old was two story now 1 story and has been added on and some parts redone because it was lived in. But we are wanting to sell it for reclaimed lumber. If anyone knows anyone please give me contact information. If you still have the old home available Amanda, where are you located? Please send any information to asdofindiana@gmail.com. Thanks. of very hard wood from the 70’s and would like to sell it would you be interested? If not can you point me in the right direction please. never been out doors thank you. I have some oak logs from a house that was over 200 years old. The logs are already disassembled and are located near the Mason-Dixon Line about 30 miles west of Gettysburg, PA. I want to sell these logs and can be contacted at schmidgv@gmail.com. I have photos of the logs. I am preparing to place the freshly disassembled building into a garage but would prefer to sell them before having to do so. Leon, you may be interested in looking at my old house. It was built in 1901. The wood is in great shape. Would like to talk with you if you’re interested. It’s over 1600 square feet of great wood. Please email me if you’d like to see it. Where are you located at Patti? Please send information to asdofindiana@gmail.com. Thanks. I have 4 bedroom 2 story old house in Florida built over 100 years ago. Outside wood is unpainted. Inside wood is painted in 2 rooms downstairs and natural pine in 2 bedrooms upstairs. In bad state of disrepair and cannot afford to save it. Interested in bids to tear down/buy wood for repurposing. For sale: Reclaimed Western Red Cedar. Approx. 50 years old. Every board individually stamped and smooth finished. Nails have been removed. Approximately 1300 board feet. Call Chuck at 501-209-6135. I have a complete 1840ish log cabin for sale .Two story with loft . All logs great shape. Disassembled , tagged and stacked indoors. Some original sash sawn flooring and roof planks. Photos and archives available . Contact if interested . I have a two story farmhouse built in 1900 with full attic I am interested in selling for the wood. I believe the wood is oak. If anyone is interested they can contact me at wyomingevans@aol.com. The house is located in Delaware. do you ever go to south east Nebraska. old farm house with woodwork, doors, & flooring we would like to sell. what sort of a price would you offer or if not what would you suggest we ask for the wood. I have a house built in 1890 with hand plained heart pine. It is 1730 sq ft. What price could I expect to get for such property. I live in SE Alabama. Will have about 1500 b/f pine/spruce pattern #105 60 year old siding which was stained (now faded) red. I have an old dog trot home with two bedrooms, it has slat wood. I can date it 1898 for sure. It did have plumbing added i.e. : Kitchen Sink, Bathroom and another bedroom in the 1970’s. I am looking to sell this house whole to be moved. Is anyone interested in it. Southeast Texas. We have a 1940 three room log home on property in Georgia. Stone fireplace. Would like to have someone take down and remove. I am demolishing a old church that has old wood designs! 8 foot tall doors with glass in them in Michigan! The trim is all in great condition some is painted over. I have three windows with beveled glass and lead in the windows from an old church in Michigan. Have very old wood for sale, once was a old house,probably 100 years old. Live in Luling Texas area. Feel free to contact for pictures. I have late 1800 Barn (Hand Hewn, as was Rough Sawn Barn Beams) (Barn Wood Siding)in Sussex County Delaware, would like to sell (302)531-7922. We have a old house we are wanting to sell the wood as well as a old barn to sell both are located in Gainesville Georgia what is the best way to sell both for the wood? I have an old house 2 bedroom that is built out of toung and groove oak. The house is going to b torn down making way for progress. House is over 100 years old. Would like to sell for repurpose. Some one would need to take apartand haul off. Any one interested. I live 30 miles outside of Atlanta. Really hate to see this happen. I love this old house. Maybe it can bring someone else happiness. Currently property is under contract to b sold as commercial. Closing is set for september. Then i have 60 days to remove my property. Can anyone help or interested. The intire original house is solid wood. Celings walls and floor. House was built in mid 1800. We had to dismantle a barn on our property from late 1700’s early 1800s. All hand-hewn beams, flooring, etc. We’re keeping some but open to sell what we don’t intend to use to restore the home. In NJ. Anyone interested, please comment. Anybody interested in hickory barnwood 100 plus years.Land was purchased in 1920 barn was already there, possibly late 1800s. 9″×12″×17′, 4″×6″×10′ ,2″×8″×17’and smaller sizes. I have a 3 story victorian house that was built in 1910. We are going to be putting new siding on it. Thw planks that are on the house now we will be selling. If interested please email me. There is alot of the planks that will be salvageable. I live in Deland, Florida. Thank you!